I love to make tags and try out new techniques and use fun products on them. They are great to create with because you have a smaller canvas to work on and they can be used on so many things! They can also be adhered right to card fronts. Love the possibilities! I created three tags, all with different elements. I thought I would go into a little detail about each tag and let you know how I created them. 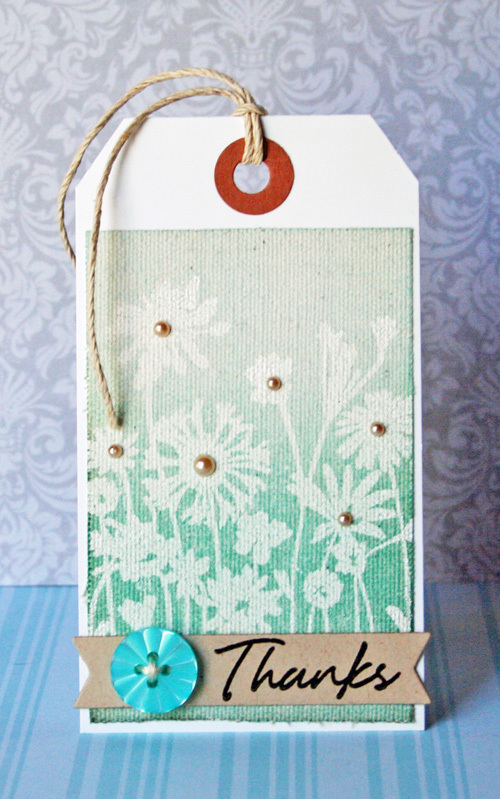 For this tag, I embossed the Blooming Meadow stamp onto sticky back canvas with white embossing powder. The embossing powder actually disappears into the canvas when you heat it, but once you add distress ink on top like I did here, the white comes through. It looks awesome in real life. Then I just added some gems, a sentiment strip and a button to complete the tag. 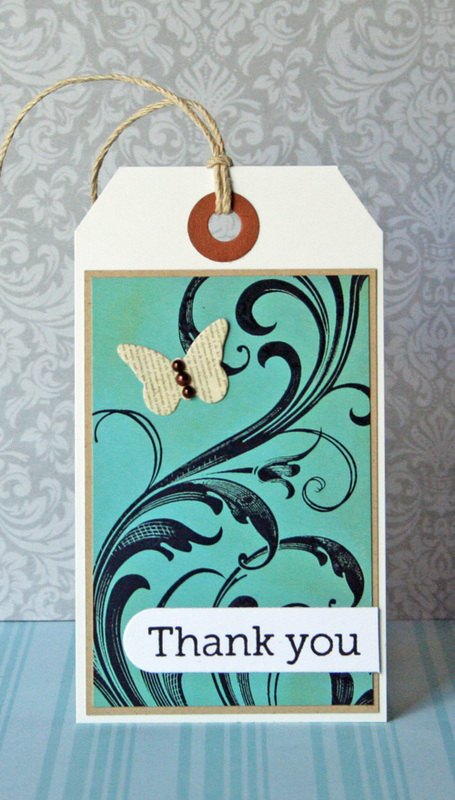 For this tag, I stamped the Fabulous Flourish stamp onto glossy cardstock with archival ink, dried it completely and then covered the entire tag with distress inks. Just rub the colour all over the tag and then wipe it with a cloth. It will leave the colour and the stamped image on the cardstock. Such a fun technique! For this tag, I adhered a glassine envelope to the tag and created a separate piece that slides into the envelope. 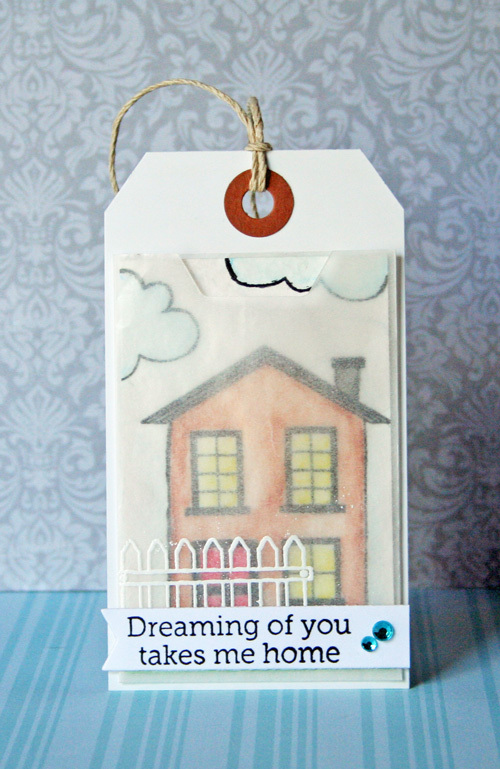 I stamped the house and cloud images onto the watercolour paper and then used my watercolour pencils to colour in the images. I also white heat embossed a picket fence directly on the glassine envelope. To finish the tag, I added the sentiment strip and gems. I hope you enjoyed the tags I created and hopefully they’ve inspired you to try out some new techniques!! Gorgeous tags! Love the canvas & envie-so creative! I like your 3 examples – I love the stamping on canvas – that is so fun. Great tags! Thanks for sharing how you made them. Love, love love these tags Steph! You so rock!!! Stephanie, they are so cute. Love different techiques you used. Beautiful tags, Stephanie! I love the different styles and techniques you used.